(ca. 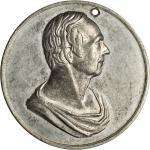 1796) End of Pain medalet. DeWitt 1796-1. D&H 833. Copper. Reeded edge. 30 mm. Extremely Fine. 1824 Andrew Jackson. DeWitt-AJACK 1824-1. Brass. 24 mm. About Uncirculated. Group of five brass Andrew Jackson medalets for the election of 1824. 1824 Andrew Jackson. DeWitt-AJACK 1824-4. Brass. 23.3 mm. MS-61 (NGC). 1824 Andrew Jackson. DeWitt-AJACK 1824-4. Brass. 23.1 mm. Choice Extremely Fine. 1824 Andrew Jackson. DeWitt-AJACK 1824-5. Brass. 23.4 mm. Choice Extremely Fine. 1824 Andrew Jackson. DeWitt-AJACK 1824-6. Brass. 23.0 mm. Extremely Fine. 1828 Andrew Jackson. DeWitt-AJACK 1828-1. White metal. 46 mm. AU-55 (NGC). 1832 Andrew Jackson. DeWitt-Unlisted. White metal. 45.5 mm. Fine. 1832 Andrew Jackson. DeWitt-AJACK 1832-4, Julian PR-33. Silver. 18.2 mm. MS-63 (NGC). 1832 Andrew Jackson. DeWitt-AJACK 1832-4, Julian PR-33. Silver. 18.2 mm. MS-62 (NGC). 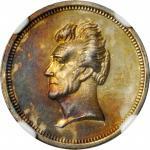 1845 Andrew Jackson Death medal. DeWitt-Unlisted. White metal. 22.6 mm. About Uncirculated. 1832 Henry Clay. DeWitt-HC 1832-1. White metal. 36.9 mm. Choice Extremely Fine. 1832 Henry Clay. DeWitt-HC 1832-2. White metal. 39 mm. MS-62 (NGC). 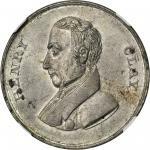 1834 Congressional Election Button. DeWitt-CE 1834-unlisted. Gilt Brass. 12 mm. About Uncirculated.